For HydroWhirl S washing diameters please refer to the PDFs on the right. The HydroWhirl® S tank washing nozzle directs the cleaning water through a rotating head at the tip of the spray assembly. This produces a vigorous moving spray action against all areas of the walls of a tank. The spray pattern from the HydroWhirl S head uses impact and repetition to quickly wash the tank. This spray pattern is especially effective at breaking up and removing contaminants. Optimal cleaning performance achieved at 60 psi (4 bar); MAXIMUM operating pressure is 150 psi (10 bar). The HydroWhirl S tank washing nozzle is an outstanding combination of design, quality, and engineering and is ideal for anyone who needs reliable, efficient cleaning of tanks and other interior spaces. 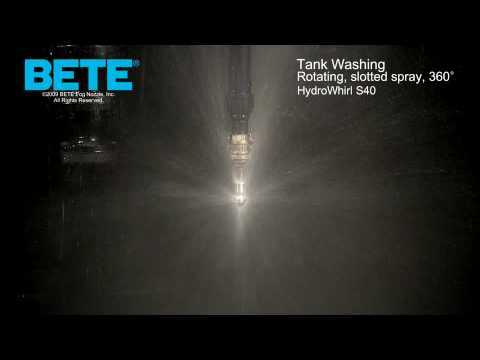 All HydroWhirl S tank washing nozzles are available with ATEX approval for Zone 0.